The symposium My Dear Liver will take place in Istanbul in the restaurant Ciğer-i-stanbul. Translated from the Ottoman Persian, this expression has two meanings: a literal one that means Liver of Istanbul and a poetical and metaphorical one that means Friend of Istanbul. In the tradition of the symposium – as a meeting of friends sharing bonds and thoughts on philosophical and artistic issues – the first evening of this two day event will see Prof. Gunalan Nadarajan and Dr. Irina Aristarkhova participate in a discussion on art theory and practice as well as curatorial issues in contemporary bio-art. 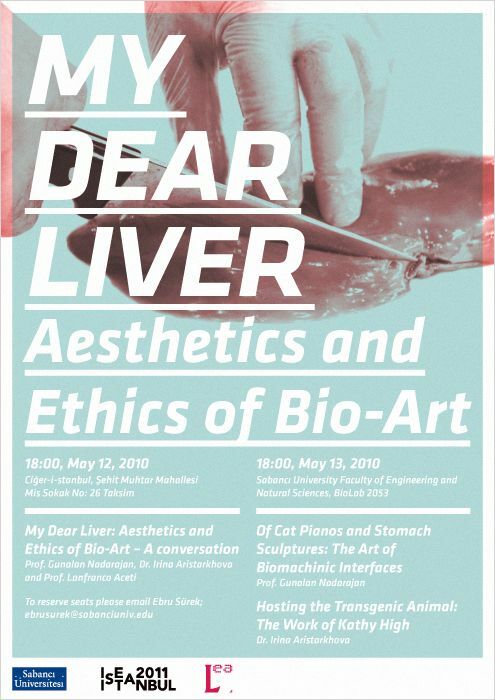 The conversation will focus on the aesthetics and ethics of bio-art and the changes and challenges to traditional cultural and artistic frameworks. On the second day there will be two formal lectures in the Biology Lab at Sabanci University: Prof. Nadarajan’s lecture is titled Of Cat Pianos and Stomach Sculptures: The Art of Biomachinic Interfaces and Dr. Irina Aristarkhova’s lecture is titled Hosting the Transgenic Animal: The Work of Kathy High. All are welcome and no registration is required. Gunalan Nadarajan, an art theorist and curator from Singapore, is Vice Provost for Research at MICA (Maryland Institute College of Arts). Prior to joining MICA, Gunalan was Professor of Art and Associate Dean for Research and Graduate Studies at the College of Arts and Architecture, Penn State University. His publications include Ambulations (2000), Construction Site (edited; 2004) and Contemporary Art in Singapore (co-authored; 2007), Place Studies in Art, Media, Science and Technology: Historical Investigations on the Sites and Migration of Knowledge (co-edited; 2009) and Handbook of Visual Culture (co-edited; forthcoming, 2010) and numerous catalogue essays and academic articles. His writings have been translated into Mandarin, Indonesian, Korean, Japanese, French, German, Italian, Romanian, Serbian, Russian, Polish, Portuguese and Spanish. Gunalan has curated twenty international exhibitions including Ambulations (Singapore), 180KG (Jogjakarta), Negotiating Spaces (Auckland) media_city 2002 (Seoul) and DenseLocal (Mexico City). He was contributing curator for Documenta XI (Kassel, Germany), the Singapore Biennale (2006) and served on the jury of a number of international exhibitions, like ISEA2004 (Helsinki / Talinn), transmediale 05 (Berlin), ISEA2006 (San Jose) and FutureEverything Festival (Manchester). He was Artistic Co-Director of the Ogaki Biennale 2006, an international exhibition of media arts in Japan and Artistic Director of ISEA2008 (International Symposium on Electronic Art) in Singapore. Gunalan’s current research interests include contemporary painting, art and biology, human-machine interfaces, robotic arts and toys. Irina Aristarkhova writes on and teaches courses in new media aesthetics, cyberculture, and feminist theory. She is currently an Assistant Professor of Women’s Studies and Visual Arts at the Pennsylvania State University, USA. Formerly, Aristarkhova was at the Communications and New Media Programme, Faculty of Arts and Social Sciences, National University of Singapore, where she founded the Cyberarts Research Initiative: a collaborative multi-disciplinary research project that included a cyberarts multi-media database, artist-in-residence programmes and a cyberarts library. Aristarkhova has edited and contributed to the bookWoman Does Not Exist: Contemporary Studies in Sexual Difference, and edited the first Luce Irigaray book in RussianThe Ethics of Sexual Difference. She holds an MA from the University of Warwick, UK, and a PhD from the Russian Academy of Sciences.